In December 1987, one week prior to its release, all 500,000 copies of what became known as the Black Album were destroyed. Prince had reconsidered his project, cancelled it and recalled all pressed copies. When Warner Bros released the album in 1994 Prince’s spokesperson quoted him as saying ‘the contribution I want to make doesn’t sound like that.’ (1994, St Paul Pioneer Press). Album has been put together through a series of conversations with the contributing artists about the processes and decisions they use to define when something they have made or done becomes an artwork. Some of the ideas that became interesting were to do with being able to situate an exhibition earlier in the process of making work. Could an exhibition become somewhere that organizes a discussion between a developing work and the artist? If exhibitions operate as a way of defining an artists’ practice by the work that is selected, how could an exhibition deal with those remainders of an artist’s practice which hover between the studio and the gallery? To what extent would artists take a risk with this? 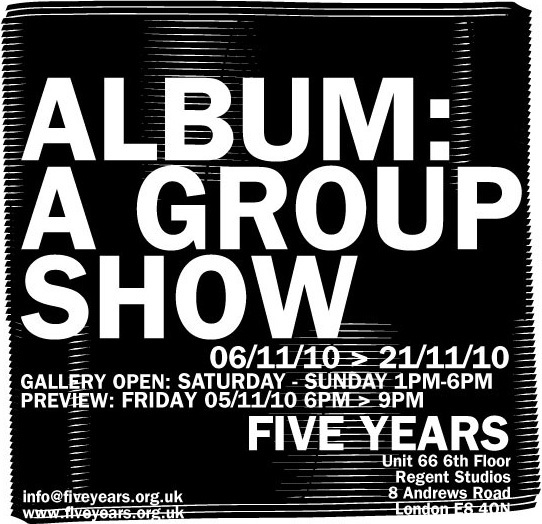 After all, the Black Album was one of Prince’s most critically acclaimed albums so could an exhibition be a space to share work that sits outside the work normally seen? For most of the artists this issue of the decisions involved in realizing art work was interesting enough. To some extent what ever is happening, and for whatever reason, the exhibition remains the same – a place for exposing a practice that for a large amount of the time remains unseen.